Commercial Pilot - ​Helicopter Flight Training Inc. The Commercial Pilot Certificate is a necessary second step for those who aspire to become Professional Helicopter Pilots and / or Certified Flight Instructors. You must hold a Private Pilot Helicopter Certificate before you can advance on the Helicopter Commercial Certificate and the Certified Flight Instructor (CFI) Rating, if you choose to become a Helicopter Flight Instructor. Pass an FAA Oral and Practical Flight Test. 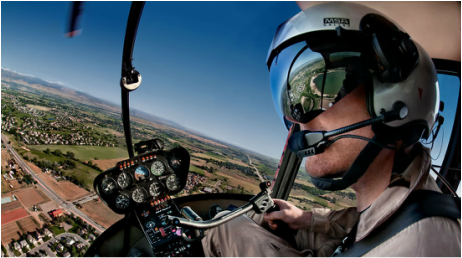 In your 150 hours (or more) of Flight Training in the helicopter for your Commercial Pilot Certificate, you are required by FAA regulations to obtain a minimum of training and experience in specific flight areas. 1 DAY VFR 2-hour (minimum) Dual Instruction Flight with one (1) 50 nautical-mile "leg"
1 NIGHT VFR 2-hour (minimum) Dual Instruction Flight with one (1) 50 nautical-mile "leg"
One (1) Cross-Country Solo flight with three landings and one (1) 50 nautical-mile minimum "leg"
NOTES: These Requirements are for Those Individuals who earn their Commercial Helicopter Certificate in helicopters without any fixed-wing flight time or experience. Pilots already airplane rated can also earn a Commercial "Add-On" Rating. Note: "Dual" Flight Instruction is Flight Time with You and a Flight Instructor Training in the Helicopter; "Solo" Flight Time is Flight Time with You Flying the Helicopter alone as the Sole Occupant of the Aircraft after Proper Preparation and Training.